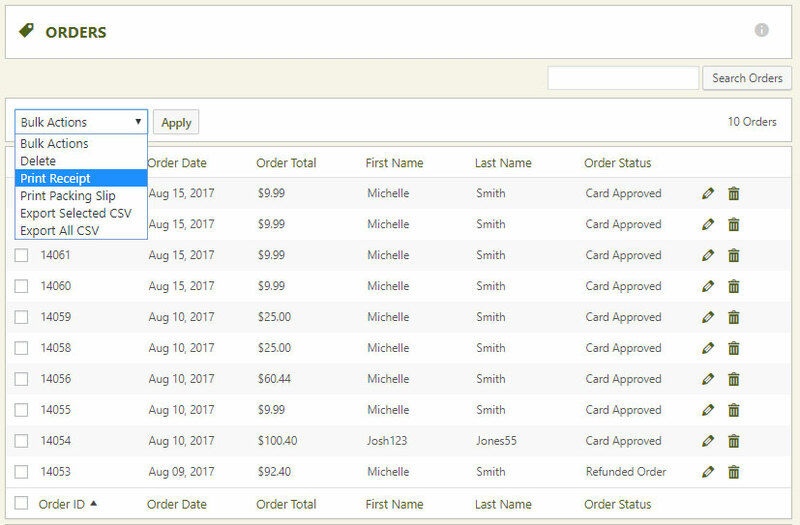 Order management allows you to view all the details of a customers order in one location. Billing & shipping addresses, all of the order details and options they purchased, along with totals and shipping details. Order Status: Third Party payments such as PayPal Standard will appear as ‘Third Party Pending’ or ‘Third Party Approved’ once they go through and complete purchase at paypal. Live processors such as stripe, authorize.net, FirstData will all have a ‘Card Approved’ status when completed. Approved order statuses such as ‘Card Approved’ and ‘Third Party Approved’ also control whether products are available for download, should you be using that system. So an order that is placed into ‘Order on Hold’ or ‘Pending Approval’ will not allow customers to see the download links for products, while a ‘Card Approved’ or ‘Third Party Approved’ will show the download links to users. Printing Receipts & Packaging Slips: These allow you to quickly get a print off from the order. Packaging slips contain check boxes to use while fulfilling or boxing orders, while the receipts contain order totals and values. Exporting Orders to CSV: This allows you to get a CSV file of order information so that you can run reports or import into another accounting software. Mark Orders Viewed: All orders will show an exclamation (!) point when they are new as well as a bubble icon in the main wordpress menu. Once an order is opened, it is marked as ‘viewed’. If you wish to remove all the bubble notices or clear the exclamation points, you can do so in bulk. 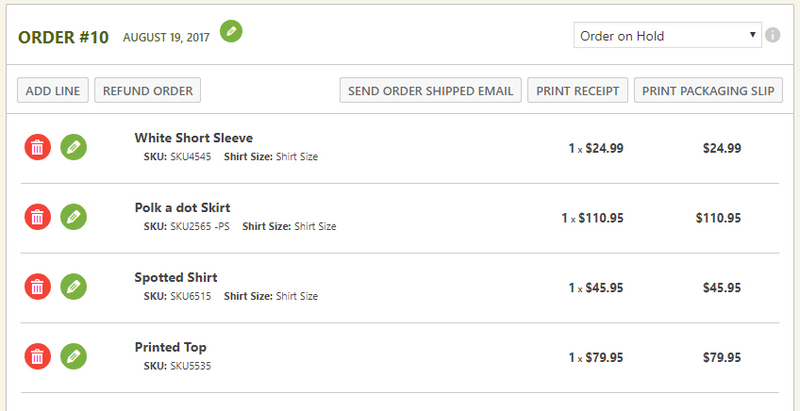 The order details contains all the order information the user has chosen. Here you have basic item information the user orders including all their options. From this area you can edit the order date, adjust order status, or even print packaging/receipts for the customer or fulfillment department. Professional and Premium edition users have the added ability to edit line items, including adding new line items and editing existing items. You may also click the ‘Send Order Shipped Email’ to the customer and it will include order details along with the shipping carrier and tracking number if you entered it on the right side of the screen. Note: Editing features are only available in our Professional and Premium editions. Free editions do not have editing enabled. Note: Some payment gateways such as stripe, authorize.net, and others allow processing of refunds via remote calls. IF you do not see a ‘refund’ button, then you will need to process a refund via your payment gateway providers website and adjust the order here manually. Marketing Information: The marketing information area is used for Gift Cards, Coupons or any private notes you wish to add to the order. We also have a weight total calculation in this area for the cart, useful for shipping. Order Totals: This location lets you process refunds and edit totals. Depending on your store setup with taxes and shipping ( GST, HST, PST, VAT, Duty, etc. ), you will see different editing features in this location. Customer information on the right side contains a lot of information such shipping/billing address and payment methods used. Shipment Section: This section lets you edit the shipping selection the customer has, including adding a carrier and tracking number. After editing this information, you may want to send the customer a shipping emailer from the middle of the screen. Shipping Address: You may edit the shipping address information if you have a Professional or Premium edition license installed. Payment Information: The payment information varies depending on the gateway used. If you utilize a live payment processor, then you will see the last 4 digits of their card, expiration date, etc. Helpful for customers who call in and you need to verify their order. Other gateways such as PayPal may not show this information. Billing Address: You may edit the billing address information if you have a Professional or Premium edition license installed. Customer Collection Info: We collect the customers IP address and whether they agreed to your checkout terms & conditions. This is often helpful information with disputes and fraudulent charges.